Eduard Retiene is a Breton farmer residing in the small town of Water's Edge with his wife Jolie. Like most of the residents at Water's Edge, he will be killed by the Blackwood Company during Infiltration. Eduard lives a very relaxed life, spending all of his time inside his house alongside his wife. They will share a two hour lunch at noon and also a two hour dinner at 6pm. Outside of these times, he can always be found wandering around the house. Like his wife, he does not sleep. His peaceful life comes to an end during the related quest, when he is replaced by a goblin and killed by the Blackwood Company. His body will then be placed in the center of the town with the rest of the residents who were killed. He wears a set of lower class clothing. He is armed with an iron mace and carries a small amount of gold. 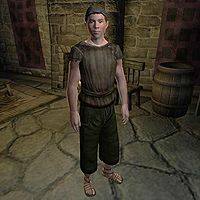 He is the victim of a Scripted Death, but is not flagged as an essential NPC. Thus it is possible for him to effectively "die twice". Eduard was supposed to venture outside between 2pm and 6pm, but he only has a "find" package with no target item, and the location center is right on the junction between the main road and the small village road. Since there's no target item, he stays inside the house.